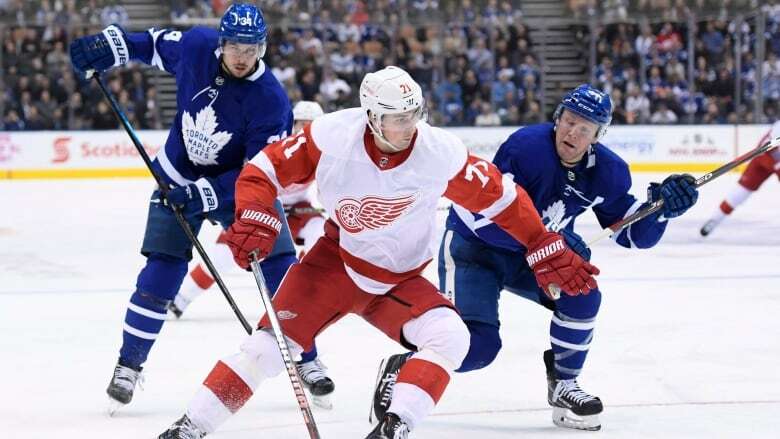 Dylan Larkin scored at 2:48 of overtime as the Detroit Red Wings beat William Nylander and the Toronto Maple Leafs 5-4 on Thursday despite blowing a three-goal lead in the third period. Nylander agreed to a six-year, $45-million US deal minutes before Saturday's deadline for the restricted free agent to be eligible to play in the NHL this season. "We were better than them for two periods," Detroit head coach Jeff Blashill said. "Our guys battled extremely hard and [I'm] proud of the way that they played." "We did a real good job to get ourselves a point, but they were the team that deserved the two," Babcock said. "We didn't have enough hands on deck."